eCommerce - How Business Intelligence contributes to your Business? 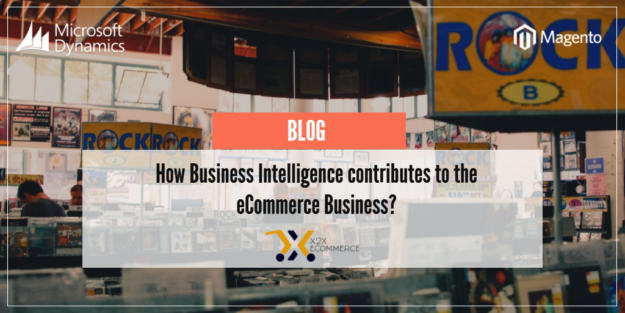 Comments Off on How Business Intelligence Contributes to the eCommerce Business? How Business Intelligence Contributes to the eCommerce Business? Would you drive a car without working headlights? Have you ever thought of driving your car without headlights? Probably not. So, will you drive your business without the ability to see clearly ahead of you? Those who do see the competition, with clear visibility, are able to drive straight ahead. Information is the basis for decision making. The timely availability of accurate information or lack thereof can make or break a business. It does not matter if it is a physical store/warehouse or an eCommerce business. Timely and accurate information determines if your company is going to be at the top of the market or will barely make it out of the gate. BI or Business Intelligence is the collection and organization of business related data accumulated over a period and presented in a meaningful way to make it easy to understand, comprehend and to serve as the basis for business decision making. Top Performers: Most profitable advertising campaigns, customers, segments, products and Sales Channels. Margin Analysis: cost and profitability of products and product lines. areas where margins can be increased, price sensitivity and elasticity of demand. Sales Report: Sales Analysis, sales, returns, taxes, shipping, refunds, discount coupons, promotional offerings, credit card collections etc. In a typical day, the biggest task business managers face is to manage their time. Variance or exception reporting makes it easier for them to concentrate on the areas that require immediate attention. The ability of BI to do variance and exception reporting allows the business managers to know where the problems are and to drill down further to establish the root cause of their problem. The concept of Dashboards is not new. They have existed for decades, though not in the fancy form that you find them in now with drill down feature for further analysis. Dashboards put all the diversified information together in one place. This allows Managers to have a global view of the state of their business. They can drill down on the areas of their interest or where they see the need for taking corrective action. Dashboards save substantial time by helping a manager know the state of the business at a glance. Performance scoreboards provide measurement to the extent the objectives of the business were achieved. They highlight the areas requiring immediate action and monitoring. Further analysis of the scoreboards allows managers to identify the customer group, product line or the individual products and customers where the actual performance is lagging behind expectation. The eCommerce tracking module of Google Analytics is a very powerful tool in the hand of eCommerce Managers to analyze the direction in which their business is heading. The data available to users includes total revenue, average order value, conversion rate, the number of unique purchases, the number of transactions, quantity sold and sales by product. How much visibility do you have? The visibility that you have about your business largely depends on the eCommerce platform that you are using. Usually, basic custom eCommerce solutions do not only have limited reporting but also are not robust enough to adapt to the changing market realities. X2x eCommerce uses Magento eCommerce as its front end. Magento comes bundled with tons of reports. There is a huge library of reports available from its strong eco system of 150,000 developers and implementers. Magento provides most of the required reports and a lot more. This enables x2x eCommerce to help you in successfully navigating your business toward success. Increase your Market Share and Grow your Business by offering X2X eCommerce to your potential and existing clients. Earn customer loyalty and trust by providing them with an efficient solution that can help them take their business to the next level. Posted in ERP Software Information | Comments Off on How Business Intelligence Contributes to the eCommerce Business? INFOGRAPHIC : 15 Reasons Why You Need x2x eCommerce! eCommerce CRM or Standard CRM? What’s your pick? Future of Mobile eCommerce – What’s in It for Us? Unified Commerce – What Is It All About?